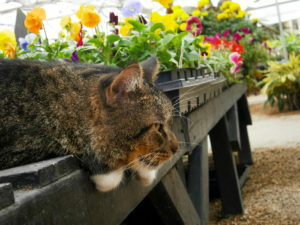 No nursery is complete without a cat laying around (or on) your plants. That's why it is with heavy hearts that we must say goodbye to our four legged friend, Spartacus. What we thought was an upper respiratory infection unfortunately turned out to be cancer. We want to thank Dr. Pavlov, Dr. Peters and all of the caring staff at Pavlov's Dog and Cat Hospital who helped us take care of Spartacus throughout the years and in his final days. 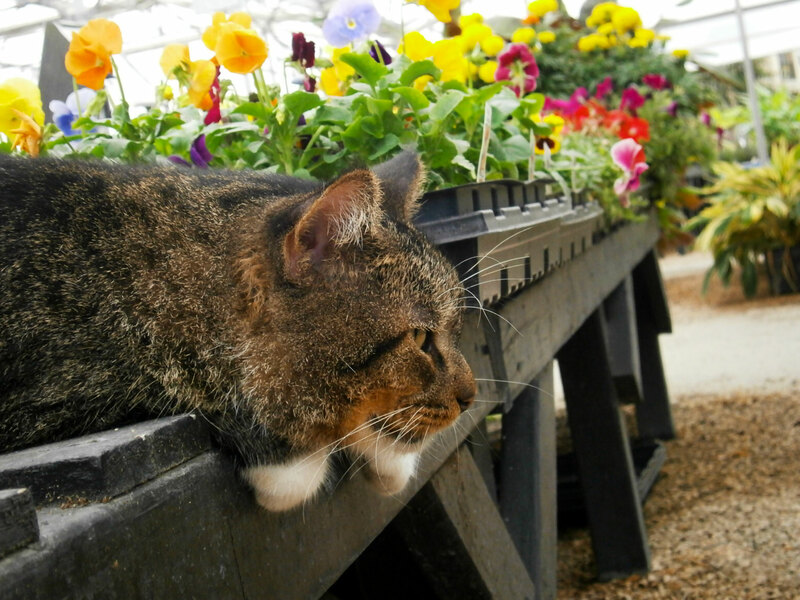 Spartacus was not your ordinary nursery cat. He came to The Garden Center as a stray kitten hiding out in the bushes. He would cry to get your attention, but was too shy to come near. It's safe to say he got over that with time and kibble. We will miss opening up in the morning with him waiting by the door. He was always present at our weekly staff meetings, even though we know he was just there for the tacos. 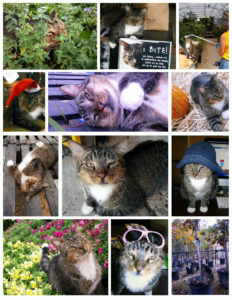 We could never hide the trays of catnip from him, and before we knew it, we had smushed plants and a happy cat. Spartacus was good at bringing us gifts of mice, lizards and the occasional snake. YIKES! You could never turn on a water hose without Spartacus begging for a drink. In the summer, he liked to be hosed down to cool off. Weirdo. He learned the commands "jump", "go to your spot", "shake hands" and could give you a "high five". If he wasn't getting enough love and attention, he would chase you down and grab your ankle. He let us do all sorts of goofy things to him for good photo. We'll miss dragging him inside at the end of the day to keep him from chasing the raccoons at night. He could be grumpy and unpredictable at times and therefore came with his own warning label. Cats, you know? We're told that he turned into a Tazmanian devil once when getting his teeth cleaned, but Dr. Pavlov would always still say he was "such a good kitty". And he's right. 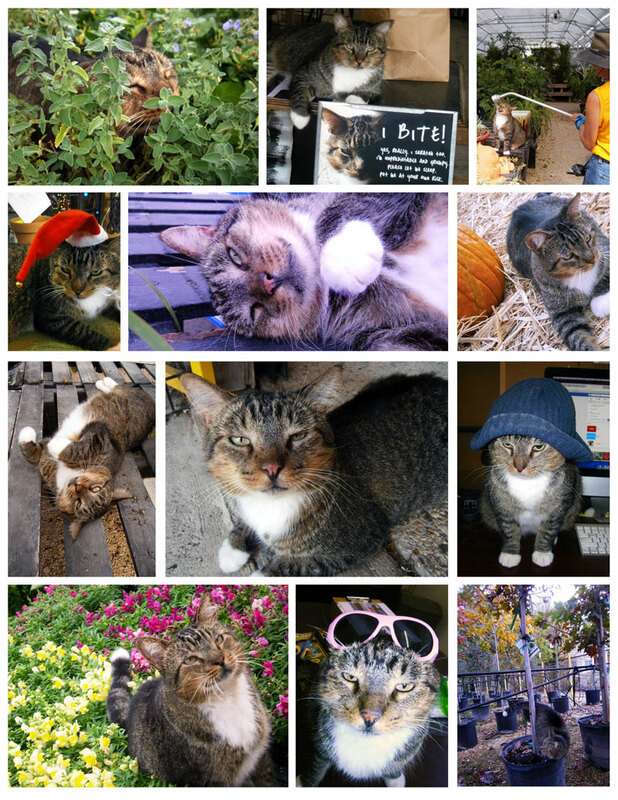 We don't care what anyone says, Spartacus was the best nursery cat ever. Do you love the smell and taste of rosemary? Not only is this woody perennial herb a wonderful ingredient for cooking, it's easy to grow in your landscape! There's lots of different varieties to choose from, all of them are edible! Some varieties grow upright while others spread like a ground cover. Upright varieties can make nice borders or hedges, while trailing varieties look great spilling over a retaining wall or out of a container. 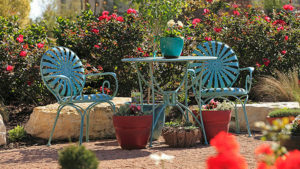 At The Garden Center you can often find Tuscan Blue or Barbecue (upright), Prostrate or Lockwood de Forest (trailing). Tiny blue flowers will appear in spring and summer, attracting those oh so beneficial bees! Rosemary grows best in full sun. Yes, even our San Antonio summer full sun. Its Mediterranean origins mean that it can tolerate lots of heat and drought. It needs well draining soil and good air circulation. Too much water and cramped conditions can cause mildew issues and less flavorful foliage. Another great thing about rosemary is that deer think it's an acquired taste and won't bother it. 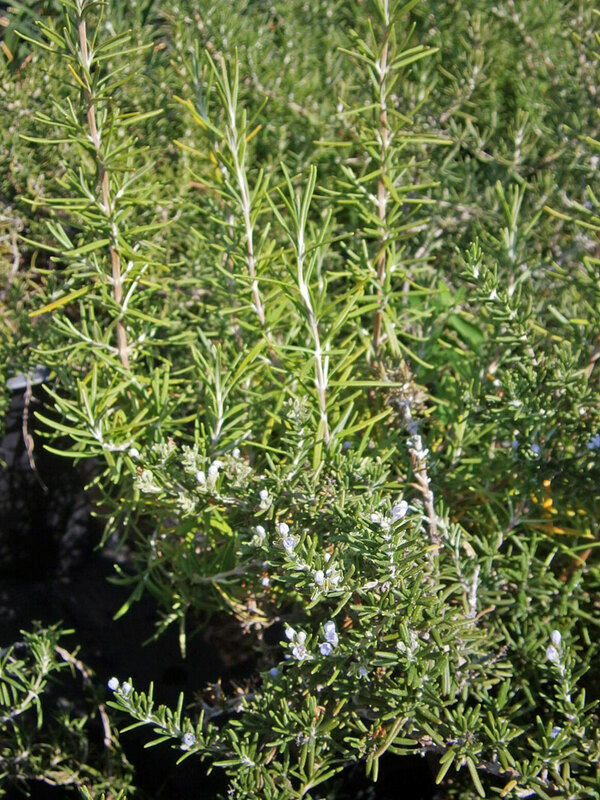 It's no wonder that rosemary was selected as The International Herb Association's Plant of the Year in 2000. Ready to plant yours? They are available nearly year-round at The Garden Center. Come by and run your hands through them. You won't be able to resist!